What would you do if you walked up to an ATM and saw a notice that said “ATM Out of Order - Indefinitely” or worse yet, you’re staring at a blank screen? You would probably turn around and head right on over to the front door to walk inside and speak to a teller. Uh oh, one big problem; the door is locked. Looking closer you realize the bank isn’t even open. Can this really happen? Yes. Will this happen? Who knows? Whether it’s for a week, a month or several months, wouldn’t you feel better if you were prepared for just such a catastrophic event? Believe it or not, I ask myself, and anyone concerned, this question each and every time the topic of precious metals is discussed. Why? Because I believe that one should always be prepared for just such an event by closely holding something, anything, of transactional value. Whether it’s some gold or silver coins in your bedroom drawer, a gold chain around your neck, a gold ring on your finger, or a wad of $100 bills; I firmly believe you should have something other than an ATM card as an emergency source of purchasing capital. I am not one who purchases precious metals as an investment; although I did do quite well buying my first holdings back in 2002. Instead, I see them as an emergency source of funds and a way to protect future purchasing power. As an emergency source of funds, I prefer to have a stash of silver dollars, gold coins of various sizes and a chunk of cash; all of which is stored where I can get at it quickly. For protection against a large dollar drop, or to protect yourself against future inflation, you should consider precious metals stored and insured safely away. Yes, I do understand that if a catastrophe happens your precious metals may be far off in a vault somewhere. From my perspective, if owners of precious metals were able to get at their holdings when Columbus was sailing around the Atlantic, then I should be able to get at them even after a reckoning. Yes, it might take a while, but that’s why I have the closely held reserves. 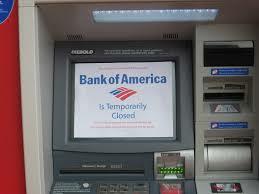 There are many things that can cause that ATM machine to stop working; terrorism, financial meltdown, or even good ole Mother Nature with her solar flares, earthquakes and hurricanes. With a few simple, easy and accessible moves to keep you and your loved ones in the game, you can make sure you don’t get caught holding just an ATM card. Contact us today and let us help you achieve a greater level of financial security.